Note: You can enter this giveaway one (1) time per e-mail address per day. Deadline is 11:59PM ET 3.27.18. Dust off the bowl of lemons. They’re not just for decoration! Whether sweet or savory, all things improve with dash of zest or squeeze of citrus. 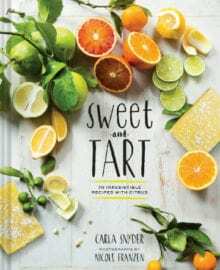 With over 70 recipes with muffins, tarts, frozen delights, plus tips and tricks to get the most out your citrus fruits, Sweet and Tart has something to make all your lemon, lime, grapefruit and orange dreams come true. For dinner tonight make citrus the star; start with a Grapefruit and Watercress Salad, then move on to some lovely Crispy Rock Cod with Citrus Sauce and finish off your evening with a slice of the very best Orange Olive Oil Cake. NO PURCHASE NECESSARY TO ENTER OR WIN. Void where prohibited by law. Open to legal residents of the 50 U.S., D.C. and Canada (excluding Quebec) who are at least eighteen years old at the time of entry and have internet access. Begins on 3.6.18 at 12:00:00 a.m. ET and ends on 3.27.18 at 11:59:59 p.m. ET. To enter this giveaway, submit your full name and email address on this form. Odds of winning this giveaway depend on the total number of eligible entries received. Only one (1) entry per email address per day. Sponsored by Leite’s Culinaria, Inc. For more information, visit our Official Rules. For a list of winners, check out our Very Happy Winners page. Be sure to add giveaways@leitesculinaria.com to ensure notification if you are the winner.